UpFront with NGS: Anniversary of the CA Gold Rush -- Did your ancestors participate in this or earlier Gold Rushes? Anniversary of the CA Gold Rush -- Did your ancestors participate in this or earlier Gold Rushes? 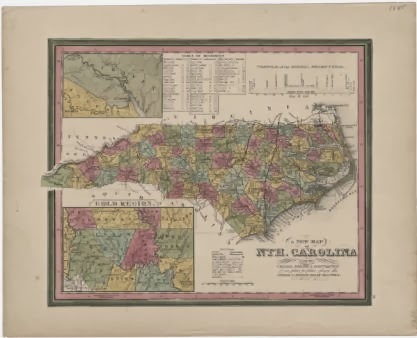 c. 1846 NC Map showing "Gold Region"
Did your ancestors seek their fortune by participating in the CA gold rush? Share their story ! Note that CA was not the only state to have a gold rush. In fact, North Carolina had a gold rush which took place much earlier followed by a Georgia gold rush. Are you aware of other gold rushes which occurred? Where? When? What records might be extant?